ChiIL Live Shows: Michael Jackson the Immortal World Tour by Cirque du Soleil at United Center 7/20 & 21 Only! 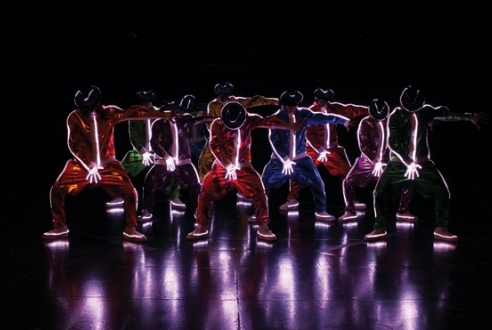 Michael Jackson the Immortal World Tour by Cirque du Soleil at United Center 7/20 & 21 Only! This Friday, the uber talented, world class performers of Cirque du Soleil will be at United Center once again, with a much different show than Dralion, Quidam or Ovo. Get your tickets now for this unique experience. Michael Jackson the Immortal World Tour is here for TWO SHOWS ONLY--July 20th and 21st at 8pm. Michael Jackson THE IMMORTAL World Tour by Cirque du Soleil, written and directed by Jamie King will perform in Chicago on July 20 and 21, 2012. In partnership with the Estate of Michael Jackson, this once-in-a-lifetime electrifying production will use Cirque du Soleil creativity to give fans worldwide a unique view into the spirit, passion and heart of the artistic genius who forever transformed global pop culture. Tickets are available at cirquedusoleil.com/MichaelJackson and Ticketmaster.com or by calling 1-800-745-3000. Tickets range from $50 to $250 each (taxes and fees may apply). A riveting fusion of visuals, dance, music and fantasy that immerses audiences in Michael's creative world and literally turns his signature moves upside down, Michael Jackson THE IMMORTAL World Tour unfolds Michael Jackson's artistry before the eyes of the audience. Aimed at lifelong fans as well as those experiencing Michael's creative genius for the first time, the show captures the essence, soul and inspiration of the King of Pop, celebrating a legacy that continues to transcend generations. THE IMMORTAL World Tour takes place in a fantastical realm where we discover Michael's inspirational Giving Tree-the wellspring of his creativity. The secrets of Michael's inner world are unlocked-his love of music and dance, fairy tale and magic, and the fragile beauty of nature. Tickets are available at the United Center Box Office, Ticketmaster Outlets, Ticketmaster charge by phone at 800-745-3000 and online at Ticketmaster.com. For complete ticket information including lost, stolen, or counterfeit tickets and mobile device ticketing, please refer to United Center's Guest Relations A to Z Guide. Please contact a Group Sales Representative at (312) 455-7469 for groups of 12 or more. 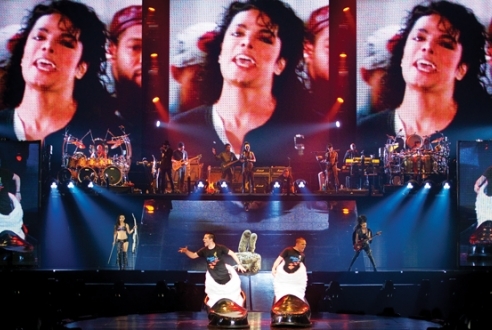 The video projections in THE IMMORTAL World Tour not only act as storytelling devices, they play a key role in making Michael’s presence palpable. Projection Designer Olivier Goulet integrated video content such as footage of Michael’s performances and real-time projections of the performances on stage. Michael Jackson THE IMMORTAL World TourTM is a once-in- a-lifetime electrifying production that combines Michael Jackson’s music and choreography with Cirque du Soleil creativity to give fans worldwide a unique view into the spirit, passion and heart of the artistic genius who forever transformed global pop culture. The show is written and directed by Jamie King, the leading concert director in pop music today, and features more than 60 international dancers, musicians and acrobats. The underpinnings of THE IMMORTAL World Tour are Michael Jackson’s powerful, inspirational music and lyrics— the driving force behind the show—brought to life with extraordinary power and breathless intensity. Through unforgettable performances Michael Jackson THE IMMORTAL World Tour underscores Michael’s global messages of love, peace and unity. 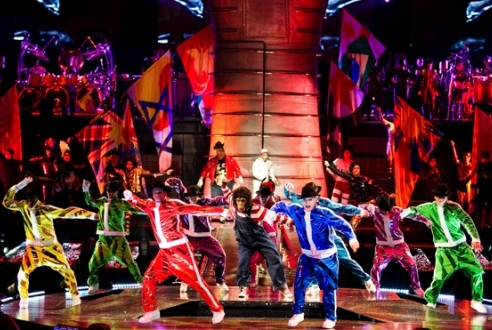 Michael Jackson THE IMMORTAL World Tour will perform in North America through fall 2012 and then move to Europe. Click here for the show's main site. Transposed in the theatrical and acrobatic language of Cirque du Soleil, Michael Jackson’s music and his messages have taken on a life of their own. In front of the gilded gates of Neverland, the Mime awakens the bronze statues that inhabit this magical place. In a wild, high-powered number, dancers and acrobats in tribal costumes climb, jump and flip around the stage. In front of the Neverland gates, the Fanatics take part in a friendly competition as they lipsync and perform to the sounds of a Jackson 5 medley, which finally allows their passage into Neverland. In a scene that evokes an ironworks factory, a group of welders fly and swing on motorized cables. They perform on various “dancing machines,” paying tribute to different dance styles. A tableau that celebrates Michael’s love of animals. Suspended in the air, artists perform a sensual aerial tango as if they were in an anti-gravity nightclub. Fleet of foot, dancers perform a choreography that showcases Michael Jackson’s iconic moves, including his famous leaning motion. Surrounded by gangsters, a female acrobat performs a “dangerous” pole-dancing act. 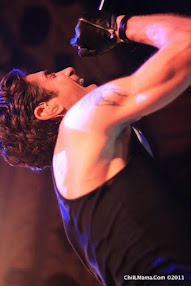 Suddenly inhabited by Michael Jackson’s spirit, the Mime is completely transformed and infused with Michael’s talents as he performs a funky beatbox number. While a 3D version of the Neverland logo (Michael as a boy sitting on the crescent moon) is suspended above the stage, artists representing the constellations wearing multicolored LED costumes swoop, soar and float in the air. 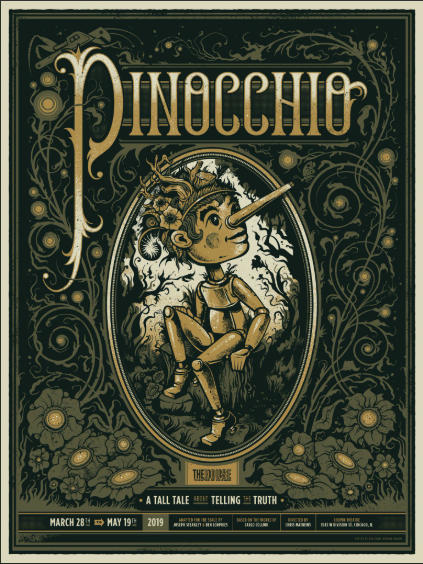 Like a mind-bending storyteller, a contortionist comes out of a giant Book of Tales. As beautiful as she is strange, she turns the pages in the most unusual positions. Suspended upside down at first, artists wearing striking winged bat costumes perform a dramatic choreography. This scene re-imagines Michael Jackson’s original choreography for Thriller and showcases his iconic moves. Acrobats and dancers dressed as mummies perform among coffins and tombstones in a cavalcade of jumps, leaps and bounds. Appearing as a black and a white swan, two artists emerge from a lake to perform a graceful straps duo. An aerial ballet of strength and emotions. Embodied and manipulated by the Fanatics, Michael Jackson’s signature accessories – his famous glove and penny loafers – are brought to life. In the final moments of the scene, an electric guitar and an electric cello engage in a rock-infused duel on center-stage. Inspired by the video Michael Jackson made with basketball superstar Michael Jordan, artists play with basketballs and perform a hip-hop- inspired choreography. In a menacing atmosphere, the Mime dances with Mother Earth. Acrobats execute a perfectly synchronized tumbling act, flinging themselves in the air and bellyflopping onto the stage as Ninja-style aerial dancers suspended above interact with the Japanimation- inspired sequences projected on the screens. 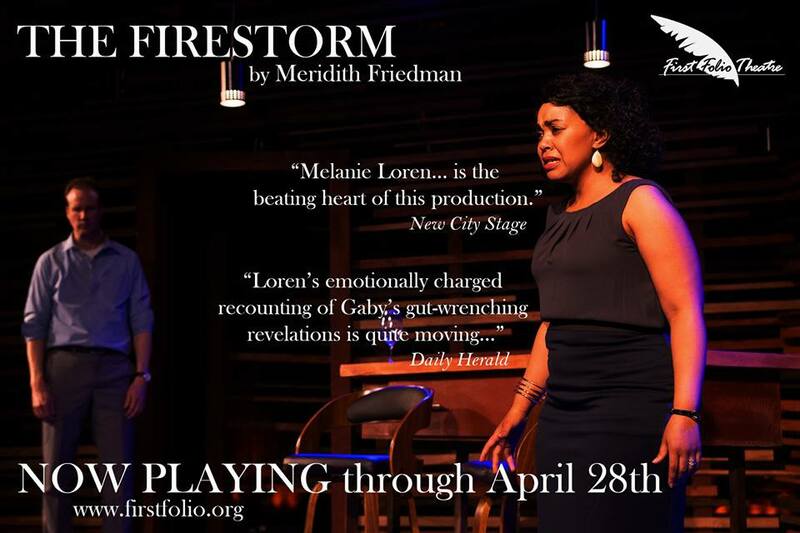 The scene evokes the destruction of the world: the tree is ablaze and the planet is in peril. In a reenactment of the number that was designed for the THIS IS IT concert tour, artists dressed like soldiers wearing robot suits with LED breastplates line up to perform a powerful choreography in unison. As the soldiers’ breastplates begin to glow, artists descend from within the audience onto the stage holding red glowing hearts in a scene that evokes rebirth. This sequence is a fusion of music, dance and acrobatics. During Can You Feel It acrobats execute a Swiss rings act moving from stage to sky. This scene segues into a riveting dance number on Don’t Stop Till You Get Enough. Michael’s famed choreographic style is showcased once more during the Billie Jean sequence; his silhouette is revealed by the dancers’ LED costumes. In Black or White, performers manipulate flags in a tribute to the nations and dance styles of the world, including African, Spanish, Thai and Georgian dances. The show’s finale culminates with the song Man in the Mirror – a song Michael often chose to end his concerts – in a celebration of the legacy of an immortal.